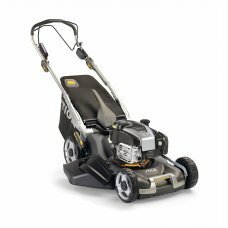 The Stiga Twinclip 50 SVEQ B features in the new range of Stiga Twinclip lawnmowers, with new technology designed in every detail to achieve the best peformance on any terrain and with minimal effort. This premium self-propelled lawnmower is powered by a 163cc Briggs & Stratton 675 IS Series InStart engine and features a robust galvanised steel chassis with a powder coated paint finish for longevity and boasts a double-edged blade, doubling mowing efficiency and power for the perfect cut. The leading edge of the Twinclip blade reduces the initial length of the grass with the second cutting edge reducing the finished length down to the desired height, the cuttings are cut and re-cut through the blades as they are blown into the collector resulting in noticeable extra mowing capacity. The Twinclip 50 SVEQ B also features the Stiga VCS system as standard - this reduces vibration to an all day working level of 3.3 metres per second squared. The heavy duty Hi-Torque cone clutch transmission is also standard, which combines light and easy operation with smooth acceleration. You can collect clippings into the 70 litre grass collector or if the grass is longer, remove the collector and choose side or rear discharge. You can simply insert the mulching plug and drive in multiclip mode or insert the mulching plug and remove the deck guard for side discharge. The Twinclip 50 SVEQ B comes complete with a mulching kit, side discharge facility and is supported by a 5 year manufacturer's warranty. The 48cm/19" cutting width makes this great combi mower suitable for moderate size gardens up to 50m x 50m.